All music MUST be turned in on a CD. One piece of music per CD please. Label your CD with your name and the name of the music. For all tests other than adult and masters tests, age is not a factor. To qualify for an adult test, the candidate must be 21 years of age or older. To qualify for masters tests, the candidate must be 50 years of age or older. The order in which tests are taken is important. According to TR 2.02 in the rulebook: A candidate shall not be eligible to take a higher-level test until all of the preceding tests in the same category have been passed or completed except as otherwise specified in these rules. We have built the $5.00 Hospitality Fee into the test fees. This goes toward keeping our Hospitality Room for the judges stocked with warm food and beverages. If you would like to donate extra for the Testing Hospitality Fund, you can use the button below to do so. Thank you. Please fill out all information in the form (below), then make payment via Paypal OR you may print and fill out the entire Test Application and mail with a check payable to Florida Everblades FSC to the address located at the bottom of the printed application. Non-Member Test Fees are 1 1/2 times the Normal Fee. Reciprocal Clubs are City of Palms and Pines Figure Skating Clubs; all other clubs must pay non-member test fees. 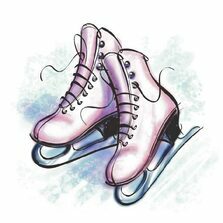 Skaters must have home clubs other than FEFSC submit a permission to test form. All Test Session Applications are taken on a first come, first served basis. Please be aware that the test session registration may close before the published deadline if the test session fills up. Priority goes to FEFSC club members first and then first registrations until deadline or until test session is full. Scheduling the tests involves many variables; individual needs cannot always be accommodated. Think carefully before submitting an application for testing on a day that you have other commitments. Test fees are non refundable so be sure that you are available to take the test at any time on the scheduled day. Please do not sign your skater up without permission to take the test from the coach or with the thought of us 'holding' until next session if they aren't ready. We will only 'hold' a test for a medical reason. Testers and coaches should be prepared to test up to one hour before their scheduled time. If the test session runs early and you are not present one hour before your scheduled time, you risk forfeiting your test. When submitting an application for a contingent test, be aware that your test fee is forfeited if you are unable to take the contingent test. If you have any questions, please contact us at testchair@fefsc.org. Please be sure to click the Submit button at the bottom of the Test Session Form. We will not receive the form if you do not click Submit before going on to the Test Payment Page. When you click the Submit Button, you will receive a screen with a 'thumbs up' sign and an offer to create your own 'Typeform'. You do not have to click through on 'Create a Typeform' or 'Enter' if you do not want to. You can now safely move on to the button below the form that takes you to the Test Payment page. Thank you!! You will receive an email from the Media Team within a week letting you know that your form and payment has been received. Please don't hesitate to contact us at fefsc@fefsc.org or testchair@fefsc.org if you have any questions or problems. After you have completed the above form and gotten the 'check mark' and/or the 'thumbs up' signal from Typeform, you can move on to the payment page by clicking the button below. If you need a test that was not listed, or have a question, please contact the test chair at testchair@fefsc.org.